Lana’i Island & beach from our room at the Ashton Mahana on Maui. Our hotel room in Maui was nearly as exciting as our daily excursions after the first night. 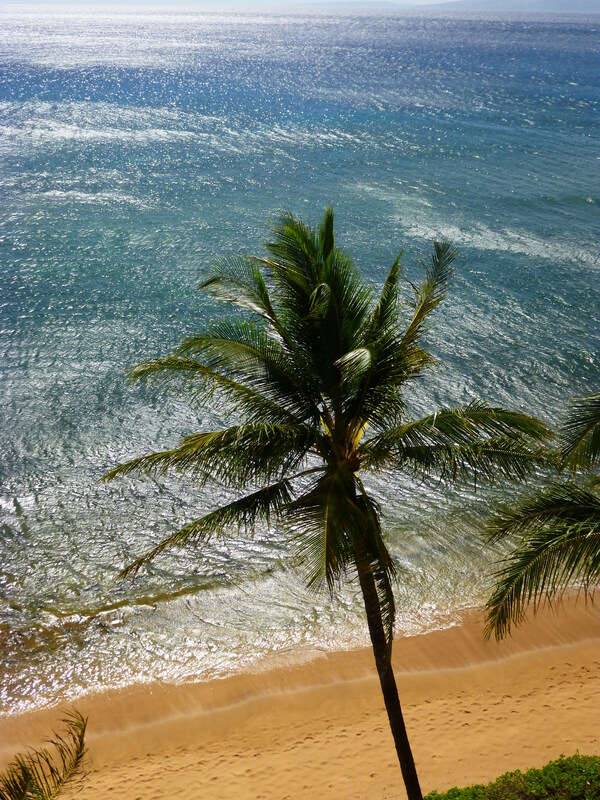 We stayed at the Ashton Mahana in Kaanapali, Room # 902. The first night was quiet enough, and the room was quite comfortable. My husband and I really liked it, with a fantastic ocean-front view. Actually, all rooms at the Ashton Mahana face the ocean. The second night I woke with a start. I felt as though perhaps I had been touched. I turned to look at my husband, but he was snoring loudly with his back to me, so I knew it wasn’t him. My heart was pounded because something – a touch or perhaps a sound – had woken me abruptly, which meant a trip to the bathroom was in order. Upon my return to bed I glanced at the clock radio, which read 3:07 AM. I immediately thought about how paranormal things tend to occur at around 3:00 AM, blew it off, and got back into a comfy position in bed. Then I glanced up at the ceiling. Our room had a white ceiling fan over my side of the bed. The fan had a circular light fixture and five blades. As I looked up at it I couldn’t help but notice a white mist encircling the light fixture. Along the side of the fan nearest the head of the bed the mist was so thick that it was completely obscuring two of the fan’s blades. I could not see either blade through the mist. I looked around for a logical explanation first. I glanced over at the kitchenette area, which was about 8 feet to my left along my side of the bed. Along the ceiling in the kitchenette is a large air-conditioning vent. The air-conditioner was running at the time so I immediately thought the mist had been formed by humidity that collected near the ceiling fan, which was in the path of the air-conditioner vent. I laid there happy with that explanation and closed my eyes. After a few minutes I got the strong urge to look up at the fan again and was surprised to see the white mist now slowly undulating around the five blades of the fan like a giant white boa constrictor. I watched, utterly fascinated. I’m assuming several minutes passed, but I never did look at the clock because I was too busy watching the mist. I tried to wake my husband, who merely grunted and never woke up so I don’t have a witness. After what I guess to have been around five minutes the mist slowly began to dissipate and it completely disappeared within a few seconds. I went back to sleep wondering if our room was haunted, but I wasn’t afraid since I deal with this type of thing on a daily basis due to the nature of my business. I told my husband about the mist the next morning. He’s an unbeliever, a Virgo and a born again Southern Baptist, so about as different from me as possible. He lifted an eyebrow and said, “well, maybe the room is haunted.” Then he smiled. I didn’t know if he was serious or just trying to humor me. The next night I woke again at around 3:00 AM to a clicking sound. The sound was not steady like the ticking of a clock, nor did it sound mechanical to me. It sounded like something was repeatedly coming into contact with a hard surface. The entire floor of this room has ceramic tile so at first I wondered if something on the floor was being moved somehow and clicking against the floor. The more I listened the more I began convinced the sound was coming from the bathroom. The sink in there is set into a cabinet with a surface covered in ceramic tile. I thought that something we had set on top of the sink was being moved in order to make that clicking sound. Mentally, I went through everything I had put on the sink and realized my razor was there. I always set my razor blade-side down so no one inadvertently cuts themselves on the blade. I realized that if you turned the razor blade side up that you could then place a finger on either edge of the blade and rock the razor back and forth on the sink. I thought, no, that can’t be what’s making the noise because that would mean some entity was in the bathroom who was able to flip my razor over and then play with it. The clicking went on for about an hour and it kept me awake. Once again, I tried to wake my husband. He did hear the clicking and told ME to go check the bathroom. Gee, thanks a heap fearless husband! I was not about to go look, so I eventually went back to sleep. The next morning I was the first one out of bed and I went into the bathroom to find my razor not only blade-side up, but on the RIGHT-hand side of the sink. I’m a lefty. I always set my razor down on the LEFT side. I asked my husband if he had moved it in the middle of the night and he swore he never touched it. Meanwhile, the slap-slap-slap sound continued and I realized it was the sound of bare feet hitting the tile floor as they walked back and forth from one end of the tiny kitchenette to the other. I think this went on for around 30 minutes, but the last time I looked at the clock 20 minutes had gone by. Then I began to drift off to sleep with the slapping sound continuing on. The following night we both heard the sound of small items being shifted around in position in both the kitchenette and the bathroom. Whatever this entity was, except for the night I saw it swirling around the ceiling fan, it had never come back into the bedroom portion of our room – something for which my husband was most grateful. When I got up in the morning I couldn’t tell if anything in the kitchen or bathroom had been moved or not, but during the night it sure did sound like items were being shifted around. The next night was our last night on Maui. Nothing happened. All was quiet. We got ready for the day and while I was using the sink I shoved the complimentary toiletries out of my way. They had been arranged in a straight line on the left-hand side of the sink. I shoved them further back and now they were in a sloppy triangular formation. I continued washing my face and getting ready. I went back out into the bedroom portion of our room to finish getting dressed. My husband was reading so he never left the bed. I went back into the bathroom intending to put my make-up on, looked down and was shocked to see the toiletries once again arranged in a perfectly straight line on the left-hand side of the sink. I realized the entity had moved them so out of spite I moved them back into a jumped mess and said, “there you go! You’ve got some house cleaning to do!” Then we left to start our day. We returned to pack for the plane ride home. I went into the bathroom. Lo and behold, the toiletries were once again arranged in a straight line! So I picked them all up & popped them into my toiletry bag and took them home. Now I have 4 tubs of complimentary hotel bath gel, hand lotion, shampoo and conditioner that have been touched by some mysterious entity. Upon checking out I described our adventures to the manager and assistant manager. Neither one had ever heard anyone speak of anything paranormal about room 902 or any other room at the Ashton Mahana; however, as one of them pointed out to me, most people would be too afraid of ridicule to admit to having had such an experience so they could not rule out the place being haunted. The assistant manager had an interesting theory. She said that many places on Maui are “haunted,” but not in the ghostly sense. Spirits of the land make themselves known on a regular basis, especially the Menehune, which are the Hawaiian version of fairies. They are known to be quite mischievous and many do not like messes. She felt that it had been a Menehune who had re-arranged the toiletries, but as to the footsteps and the white mist, she had no explanation. 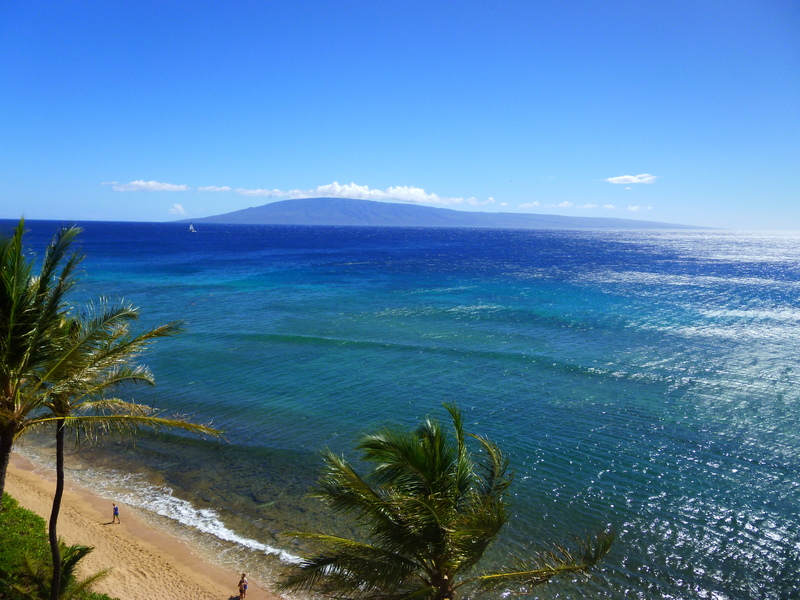 Looking toward the island of Molokai from Room 902 at the Ashton Mahana on Maui. Well, I guess so, especially since it’s happened to me before. I doubt this will be the last time. Beautiful ocean views notwithstanding, the ghost was a nice touch! It sure did add some nighttime excitement to our vacation. If we ever do go back to Maui (highly probable since we both LOVE it there), we’re going to stay at the Ashton Mahana again and request the same room. Next time I’ll be bringing some equipment along and hope to catch some evidence of paranormal activity. Previous Mercury Retrograde: I’m Grateful it’s NOT Contagious! Next Your Still Small Voice.